Created to replace the obsolete piston-engined Douglas B-26 Invader, the twin-jet engine tactical bomber B-57 Canberra was produced by US aircrafts company Martin in the 50s. Derived from the British “English Electric Canberra”, it was produced in several versions to perform bombing, reconnaissance and electronic warfare duties. 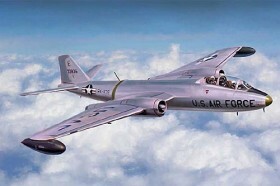 In particular, the B-57B, developed for bombing missions, was the main version produced. It was characterized by the adoption of a new cockpit with two crew members arranged in tandem and the under-wing hardpoints able to be armed with a wide range of weapons. The first units produced were armed with eight 12.7 mm machine guns installed within the wings substituted, later on, by four 20 mm cannons. Thanks to its two Wright J65 Jet-engines the Canberra was able to reach the top speed of 520 Knots.